Hey guys! I’ve meant to Post this awhile ago when funtimes came off Hiatus! I wanted to draw a nice sentiment for the Blooper this Week. There is also Some News Regarding the Bloopers, I’m possibly going to need some time to come up with more Bloopers. I’ve ran out of a Buffer for them. It’s hard for me to Work on a Buffer while Drawing / Updating for the Main Storyline. But I’m going to try that first. BUT, I do intend to Finish the Main Storyline Chapter first also so I’m asking for a possible Break on the Bloopers until I have more time to Work on a Buffer for them. I actually have bigger ideas for the Blooper / Comedy Strip Portion of Fun Times since they were inspired by my mother but that will take a bit of Planning and Writing which takes time. etc. so I need some leeway for them. Especially if I intend to do a Zine. I also need a bit of room to breathe. Please Note that I’m NOT asking for a possible Break to slack off, I WANT to Work on my Art and Comics. I’m asking for time to nourish my Work and Work on the other parts of it also. Comic making isn’t just ONE process, like Updating for example. It’s full of different parts and they all need attention to keep it running. I just want my Readers to understand I care about my Work and want to Continue Working on it until it’s Finished. Don’t forget! Once Meeting Luna: Part One ( Chapter I’m on currently ) has Finished I WILL be Working on Book Two. Then there will be Contest News. etc. so Keep that in mind! 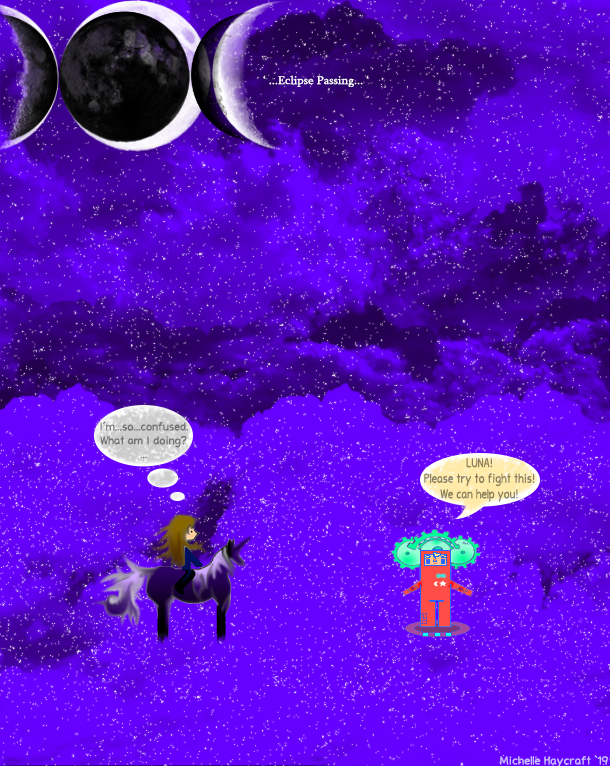 This entry was posted in Blog and tagged Art, Cartoons, Comics, Fantasy, Fun Times, Webcomics. Bookmark the permalink.